Cedar Rapids, iowa Wedding Barn Ashton Hill Farms. 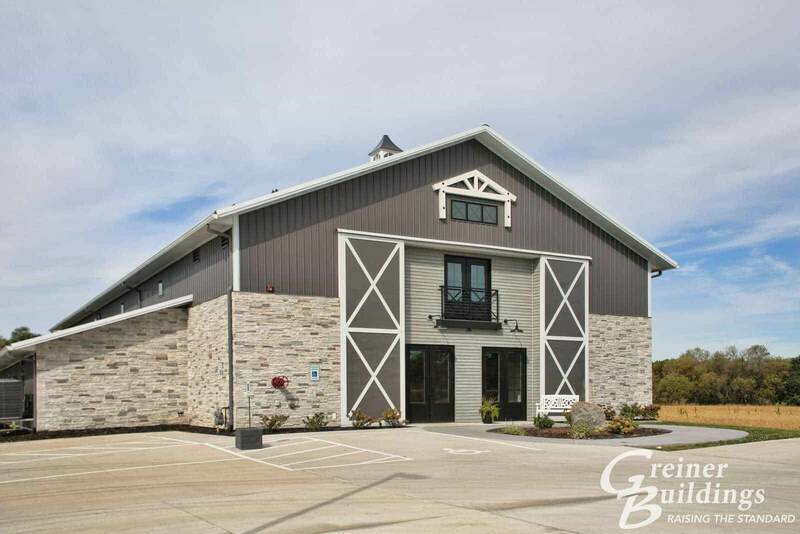 A post frame pole barn wedding venue built by Greiner Buildings, Inc.
Cedar Rapids has a special history of being known as the “City of Five Seasons”. In 1968, a local advertising agency came up with this slogan for Cedar Rapids, desiring to set it apart from other cities in the area. The community of Cedar Rapids valued the beauty of the Midwest in the changing seasons, and their idea for a “fifth season” represented the time they set aside to enjoy the seasons year round. Many residents in Cedar Rapids enjoy the seasons from a beautiful post frame home by Greiner Buildings. Pole and post frame construction is perfect for homeowners in Iowa for many reasons. Firstly, they are designed with great insulation, keeping you cool in the summer months and warm in the winter. They are built with extreme strength and quality, and will last throughout any season for years to come. Their versatility is very convenient, and you can easily make additions like porches and garages as time goes on. 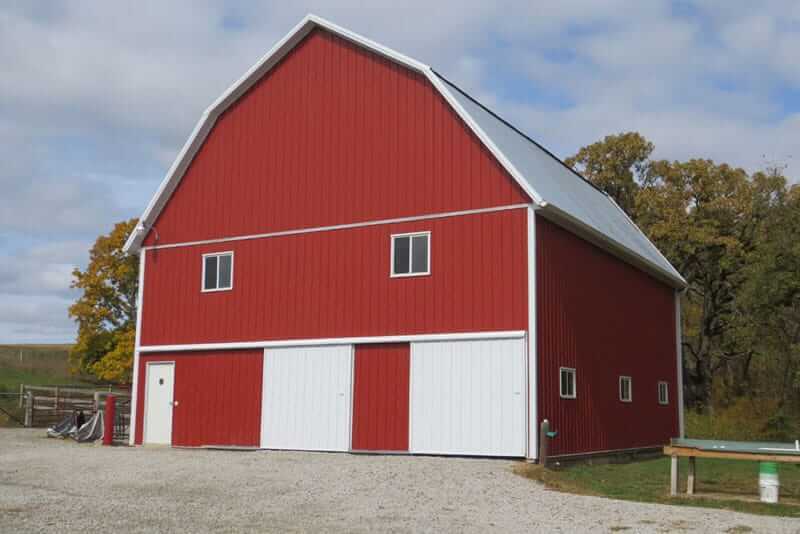 Agriculture Buildings and Cold Storage: Greiner Buildings can build any type of storage unit for you. Our buildings are of the highest quality, great curb appeal, and low maintenance. Cattle Sheds: We build custom structures that are perfect for your livestock. Our team of professionals are very knowledgeable about the needs of your animals, and we will create a building that is just right for them. Residential Homes: Greiner Buildings is proud to use post frame construction for all of our residential buildings. This type of construction works great for any type of home. It is a cost effective, energy efficient, and quality method. Let Greiner Buildings build you your dream home in Cedar Rapids, IA. Commercial: For all of your commercial building needs, Greiner Buildings uses 3D and 2D CAD designs. Our options are very stylish and attractive, yet completely affordable. Our commercial buildings are up to code and personally customized to suit your needs. Horse Barns: Do you need a stall barn, riding area, or stable? Greiner Buildings can do it all! Our equestrian buildings are of unmatched quality and efficiency. We specialize in insulating stable walls and roofs, customizing horse stalls, and putting in hay lofts. Hobby Shop Buildings: Greiner Buildings would be proud to build you a structure that will help your hobbies and business to flourish in Cedar Rapids, IA. Insulated Shops: We provide several different options for commercial shop buildings and personal shops, and we insulate our buildings to ensure that your equipment is protected. Machine Sheds: Our team at Greiner Buildings would be happy to provide you with a machine shed of any size or style. We cater to your specific needs and conditions, and construct buildings that are both durable and accessible. Mini Storage: One of the most important assets to your business is storage units. At Greiner Buildings, we make quality mini storage buildings that are easy to maintain and perfect for all your storage needs. Let Greiner Buildings be your post frame construction contractor in Cedar Rapids, IA and surrounding areas. We are looking forward to hearing from you! Contact us today for your next building or repair project.